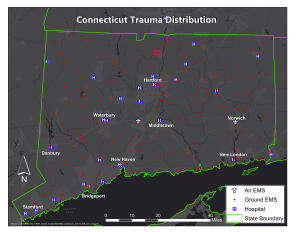 Connecticut GIS map with complete trauma resource data set. The Multi-Institutional Multidisciplinary Injury Mortality Investigation in the Civilian Pre-Hospital Environment (MIMIC) project aims to determine whether injured people who died before reaching a hospital had potentially survivable injury. But before this Department of Defense-sponsored review of some 3,000 pre-hospital deaths in six different states can begin, the investigators need to develop a comprehensive dataset and map showing access to trauma centers by level designation, ground and air EMS, travel times, and other factors necessary to determine potential survivability. To build the essential reference database, NTI hired a Geographic Information System (GIS) specialist with a master’s degree in Environmental Science and a thorough knowledge of the ArcGIS mapping and analytics platform. He has nearly completed the meticulous work of mapping all the hospitals, air transport, and emergency medical systems within the six states involved in the study, as well as the 13 adjoining states from where an injured patient might be transported. It was quickly discovered that while the locations of Level 1 and 2 trauma hospitals are easily accessible through the American College of Surgeons, every other data point needed intensive investigation of multiple disparate sources to assemble the requisite time and distance maps. With no single resource to draw from, NTI has developed an expansive search, contacting State Departments of Health, EMS Systems, Fire Departments, and national organizations, such as the National Emergency Medical Services Information System (NEMSIS). “We know this information exists, but the key is figuring out who to talk to in each state. Sometimes I can find a document to download, but more often than not, it’s a trail of contact emails, website referrals, and incomplete data sets,” said Nick Medrano, the GIS specialist working on the map. In the cases where there is incomplete data, he does the research and creates a spreadsheet from scratch that he then uploads into the ArcMap software. Medrano is also layering in information, drawn from past studies, related to dispatch response time, time with the patient, travel to and from the scene, and other EMS inputs. As a last step, he will integrate a rich set of road network data and topographic data salient to aeromedical transport and run the software protocols on each set of state data being provided by Medical Examiners offices. It will then be up to MIMIC’s panel of reviewers to use this tool to make accurate assessments of potential survivability and identify potential high yield areas for research and development in pre-hospital medical care, injury prevention, and trauma systems. “Mapping is tedious and repetitive, but once you get the data in there, you can do all kinds of analyses, and that’s when it gets very intriguing,” Medrano said. He can already envision other interesting questions that could be answered once his comprehensive GIS map is completed. “The addition of GIS capability to the MIMIC analysis will substantively enhance the potential of the research to generate real evidence-based momentum toward the continued evolution of the trauma system concept,” said Dr. Eastridge.